Continuing our QuickStart series of posts about the fundamentals of basic ISY configuration, today we’ll cover two ways to add a device to the ISY-994i. Without getting too technical, when we add a device to the ISY, in addition to telling it that this device “exists”, we’re also telling it to add an Insteon link to the device itself and to the PowerLinc Modem (PLM). It does this because we want the device to send a message to the PLM every time its state changes – and every time the PLM gets this message, it’s available to the ISY to update the status, run programs, etc.. In other words, when you turn on a device, you want the device to say “On” when you’re looking at the ISY application. The first and easiest way to add a device is to go to “Link Management:Start Linking”. Essentially what this does is tell the PLM to start listening for devices on the network that are ready to link. You would then put the device you want to add in “linking mode” by pressing and holding the set button on that device for a few seconds. It will then send a signal that is picked up by the PLM, and the ISY lets you know it’s ready to configure the link tables and for you to name the device. Here’s the thing: I don’t really advise this method of adding a device. I’ve had only limited success with it, and it doesn’t seem to work well with wireless devices like RemoteLincs. I don’t exactly have proof of this, but I’ve also been concerned about adding multiple devices at once. 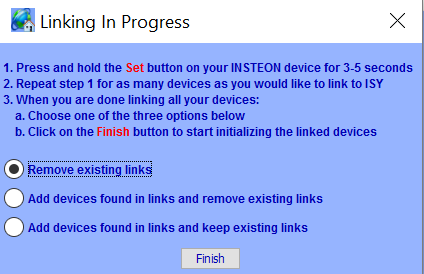 Specifically, if you don’t have an ISY or PLM, this is how you link devices together – by putting one device in “linking” mode, then do the same on the next device. So if you do have the ISY and put two devices in “linking” mode at the same time, I think it’s possible to accidentally link those devices to each other. If that happens, you may end up with one device turning on when you click a different switch – not something we’re looking for in this case! Since every device maintains its own link table, the ISY window is basically giving you the option of removing existing links or keeping them. So for example, if you manually linked two switches together so you can control the same light with one switch, you could say “Add devices found in links and keep existing links”. This will tell the ISY to add that device, and add any other devices that are referenced by it in its link table. In general though, if you’re building an Insteon network from scratch or have accidentally linked two devices, you should use “Remove existing links” to make sure that the device and the PLM have the proper link tables. So, if that’s not an ideal method to add a device, what’s better? For this I’d suggest the more straightforward approach of adding one device at a time with the “Link Management:New INSTEON device”. 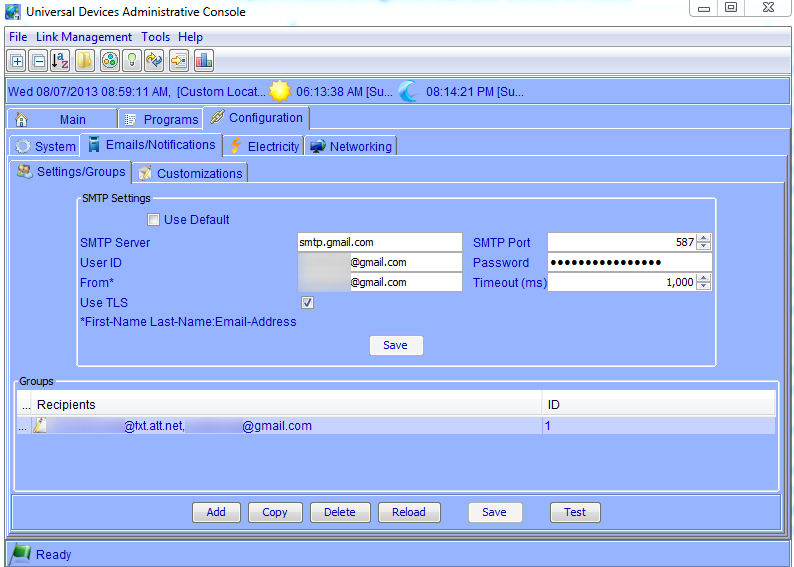 It has the same options mentioned above for dealing with link tables, but requires you to add devices by their address. The neat thing about that method is you don’t even need to put the device in “linking” mode by holding down the set button if it’s a powered device like a SwitchLinc or KeypadLinc (though you’ll still need to do it with wireless devices like RemoteLincs). Once you get the device added to the ISY, just drag-and-drop it into a folder of your choice. We’ll talk naming conventions and scenes in upcoming QuickStart posts! Thanks for this. I’ve been using the ISY for many years, but its good to have this info. Even though its been working great for me, I feel like I only use a small portion of its capability. Look forward to future posts. On a side note, I find myself having to replace some of my older ICON branded insteon devices with the newer dual band devices. Some of the older devices just weren’t responding reliably to the ISY/PLM.